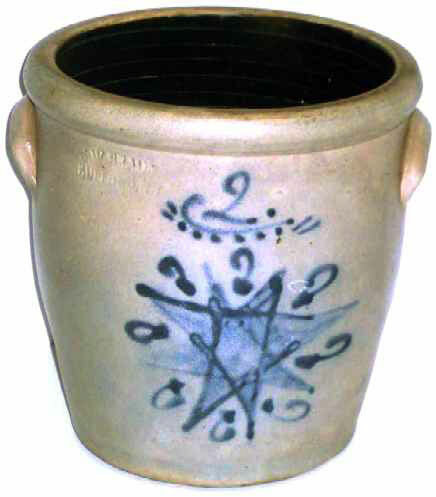 Presented here, a Salt Glazed Stoneware 2 Gallon Cream Pot with exhuberant Colbalt Snowflake Decoration. C. W. Brown, Buffalo, NY (active 1857 - 1896). Overall very fine condition. At some point there has been a small patch to the left of the decoration . . . probably a bruise. Unusual decorations on Stoneware make them very desirable to collectors. Size is 10" in diameter at the top and 10-1/2" high . . . Applied ear handles and Albany Slip interior.